Across our rural landscapes, paddock trees stand out as an iconic image, providing shade and shelter for livestock and maintaining the productive capacity of the land. They also provide food, shelter and nesting sites for a large number of birds, bats, insects and small mammals. A great project is underway in the South West of NSW to protect and restore paddock trees across the region. In recognising the importance of paddock trees, in September 2014 the Riverina Highlands Landcare Network received funding from the NSW Environmental Trust and the Riverina Local Land Services for a project to protect and plant these trees. The project also realised that whilst many landholders appreciate these magnificent trees for providing shade and shelter for stock, fewer are aware of their value in conserving biodiversity. As such, Local Land Services with Mason Crane from the Australian National University have produced a YouTube video to help raise the awareness about the value of paddock trees. 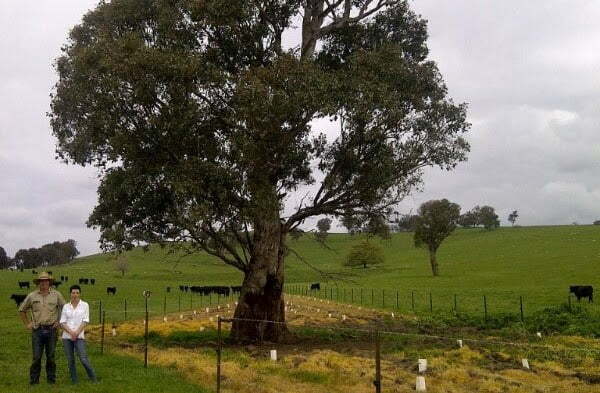 Landholders are able to access small grants of up to $1500 through the project to protect existing paddock trees, establish individual paddock trees or undertake small clump plantings. Landholders are able to use the funding towards the costs of fencing materials, individual stock proof tree guards and native plants. To date, 44 landholders in the region have taken up this offer, and as a result, have established more than 350 paddock trees, and completed 3km of fencing to protect existing paddock trees. The community based Landcare Nursery in Tumut is also involved, with volunteers growing advanced tubestock for the project. “We have found that Blakelys red gum is the preferred species for our local area, as this tree species is fast growing, survives in a range of soil types and its straight form suits the individual tree guards,” said Steve Hamill, Landcare Nursery Coordinator. One of the initial challenges was developing a design and costing for the individual tree guards. Through trial and error, the project has found that guards should be made from reinforced mesh (at least 1.8m high & 1.5m diameter) and secured with 4 steel posts. The average cost for this type of guard is around $60. Scattered paddock trees also fulfill a number of unique ecological functions by providing habitat and connectivity for a large number of birds, bats, insects and small mammals. One of the reasons why paddock trees are so valuable, is that these trees are often hundreds of years old and provide habitats like hollows and large canopies that cannot be replaced in the short to medium term. These trees are critical for a number of threatened woodland birds such as the swift parrot, regent honeyeater, hooded robin, and diamond firetail as well as threatened small mammals including the squirrel glider. The project runs until February 2017.